Why does an offhand comment about baldness condemn forty-two youths to death? What struck me first about these verses was the absolute calmness in which Elisha handled the situation. It takes a cool character to curse some mocking kids to be mauled to death by bears and then mosey on about his day as if nothing happened. Why was their insult so terrible? What was significant about Elisha’s baldness that made the youths’ offense punishable by death? Why was the punishment death by bear mauling? Did the Protagonist really wipe out three and a half dozen children over Elisha’s battered ego? 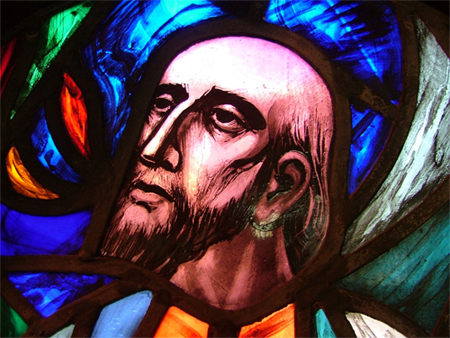 Stained glass, yet still bald, Elisha. I started with the prophet himself, Elisha. The previous prophet, Elijah, and his heir, Elisha, had been traveling through Israel, turning the people back to the Protagonist and away from idolatry. Immediately after the fiery whirlwind of chariots and angels that sweep his teacher into the heavens, Elisha must take up the mantle of prophet of Israel and continue on with the duty of mediator between the Protagonist and His people. Throughout Kings II, the Protagonist obviously favours Elisha as he fulfills his prophetic responsibilities by performing miracles and helping Israel win battles against Syria. Apparently, Elisha is also bald. Baldness in the Bible is specifically mentioned in Leviticus 13:40-41, stating that a man is still clean after becoming bald (Belgravia Centre). Being a man of some notoriety now, Elisha was probably like most bald men—quite sensitive about his hairless head. The chapter noting Elisha’s baldness does not state how he became bald. His lack of hair could be attributed to anything from male-pattern baldness to having been scorched off by the flames of Elijah’s ascension, or perhaps even shaved off to symbolize the beginning of his role as prophet, similarly to how Nazarenes shaved their heads to re-consecrate themselves after defilement in Numbers 6. Upon further research, I found that baldness was considered a disgrace by non-Jewish cultures, a very obvious symbol of personal deterioration in either hygiene or spirituality that brought on the punishment of hair loss (Bible.org). I inferred that the insult of “baldhead” was of a most malicious nature, and that the youths were implying that Elisha was beneath them. The case of Elisha was the exact opposite of what the youths implied; he was literally on a mission from the Protagonist as he traveled through Bethel, and then on to Mount Carmel and Samaria. The other part of this insult was more harmful than mocking Elisha’s baldness. The youths suggest that Elisha “go up”, definitely a reference to what had happened earlier in the chapter to Elijah. The youths were suggesting that Elisha ascend, truly meaning that they wanted the prophet gone in the terrifying way of Elijah’s departing the world. These wounding words directly spat in the face of the Protagonist, proposing that Elisha should not carry on with the duties of his position. The youths of Bethel are purposely setting themselves against the Protagonist’s spokesperson (Professor Obvious). In essence, if one mocks the spokesman, one mocks the Protagonist. The prophet swiftly addressed the two-part insult, rather calmly, as he cursed the “boys”. To remedy the upset feeling the word ‘boys’ evoked, I dug further into research to know if the translation had muddied the truest meaning of this verse. I found that I was correct; “boys” did not indicate the little children harmlessly mocking an older man that had initially come to mind. The original Hebrew phrase neurim qetannim actually translates to young lads or men, meaning that this group of youths was anywhere from twelve to thirty years old (Christian Thinktank). In addition, some basic logic helped me to realize how large of a group Elisha faced. The verse states that forty-two of the boys were killed. Forty-two of the group, as if that is an inconsequential number, makes me think that this gang the prophet was confronted by was a great deal larger and more hostile than the Bible verses seem to let on. In a tense situation between one man and a mob of angry youths, Elisha’s reaction of ferocity now seems to be the proportionate use of force. Violence only begets more violence in this chapter, as was righteously so, as Elisha was expected to continue on in the role of the Protagonist’s prophet. Finally, I delved into the actual punishment provided by the curse: the two she-bears mauling the youths for their mockery. The bear, in many cultures, symbolizes ultimate power (Universe of Symbolism). In fact, the Bible mentions bears quite a few times as reference to someone’s power. For example, David kills a bear with his bare hands in I Samuel 17:34-37; this verse is what convinces Saul to allow David to fight Goliath, and in turn, become the next hero of Israel (Bible Study Tools). Female bears are specifically pointed out as well in II Samuel 17:8, Proverbs 17:12, and Hosea 13:8 (Bible Study Tools), as their fury when robbed of their offspring is unparalleled. A medieval rabbi, known as Radak, included in his biblical commentary that “a bear’s offspring is born with a thick amniotic sack and it takes much care, toil and difficulty to bring it in to this world; more so than any other animal. So much so, that when a bear loses a cub it experiences greater anguish and loss” (Mi Yodeda). Applying this quote to the story of Elisha, the Protagonist can be seen as a literal mother bear, and to threaten Elisha is to threaten the Protagonist’s plan for His people. The Protagonist’s rage is so great that the curse plays out in literal detail.